Reach out today to talk to an experienced slip and fall lawyer in Denver. The vast majority of personal injury lawsuits revolve around the question of negligence. Negligence means that someone did something or neglected to do something that resulted in another person’s injuries. The plaintiff’s injuries were the result of that breach. But for slip and fall lawsuits, this gets much more specific. Slip and fall cases are a form of premises liability. In terms of premises liability, the most difficult thing that your attorney must prove is that the defendant owed a duty of care to the plaintiff. In many cases, the mere happenstance of a slip and fall is not enough to prove liability. Your attorney must show that the defendant is ultimately to blame for the accident. The managing party should have been aware of the dangerous condition that led to the slip and fall. 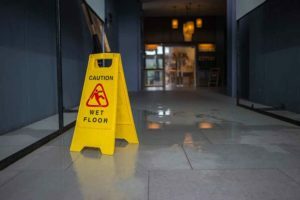 The majority of slip and fall accident claims filed against stores or commercial defendants attempt to show that the defendant should have been aware of the potential danger. Most slip and fall accident claims filed against homeowners generally show that the defendant was aware of the dangerous condition and neglected to do anything about it. The injured party made no attempt to avoid the dangerous condition that led to their accident. Often, defendants will claim that the plaintiff should have made some attempt to avoid the dangerous condition as a pretense for absolving themselves of culpability. If the defense is successful in pinning some of the blame for the accident onto the plaintiff, Colorado Revised Statutes § 13-21-111 hold that the defendant is only liable for his or her percentage of the blame. In other words, if a plaintiff receives $100,000 for a slip and fall accident, but the defendant is only 50% at fault, the plaintiff will only receive half of the jury award or $50,000. However, your slip and fall case isn’t completely destroyed by the fact that you might be partly to blame for the accident. The Olson Law Firm manages slip and fall accident lawsuits for our clients securing fair settlements from insurance companies and at-fault parties. If you’re facing injuries due to another’s negligence, contact us online and we can begin discussing your case immediately.